You are here: Home / Gadgets / Apps / Home Theater Quality Sound…For Your IPad! Home Theater Quality Sound…For Your IPad! More and more people are watching videos, listening to music, viewing television programming, and movies or more anytime and anywhere with their tablets, especially with their iPads. While video capabilities have gotten better and better, many find that the sound from their mobile devices could certainly be better and that a more enjoyable viewing experience could be had if better sound delivery was achieved. For those who simply want more and better sound capabilities there is a great new product that turns the iPad into a real viewing powerhouse. The Belkin Thunderstorm iPad case is the answer many have been looking for. This simply enhances the experience that Apple offers by way of its Retina Display and excellent content and streaming features. While the Thunderstorm initially appears to be like any other iPad case with openings for the camera to function, for headphones and for a microphone, there really is a lot more to this black case than the usual. There is an aluminum speaker grill built in to the front of the case. Your iPad connects to the case and its speaker by way of a built in 30-pin connector. The speaker has a 10 hour battery life so that it can go anywhere and work with your iPad. For those who want a great listening experience to match the unsurpassed viewing experience already offered on the iPad, this is a great set up. Most users already buy a case of some sort for their device and many purchase either a Bluetooth speaker or a speaker dock in order to enhance the iPad’s sound performance. This rolls all of those needs into one package, a case, a speaker, and portability are all offered in this Belkin product. While volume is not the aim of this product, it is more than passable in that regard. What is surprising and pleasing is the great sound quality that those who have tried this product all seem to be reporting. Even lower end noises like the rumble of thunder sounds better with the Belkin speaker in use. A much more theater like experience is available by using this product. The rumbling bass makes viewers feel more like they are sitting in a theater rather than watching a movie or other video while on-the-go. Gamers will find this case and its speaker superb for enhancing their experience as the rumbling from this speaker is often compared to vibration features found in controllers offered by gaming console manufacturers nowadays. This case is heavy and will double the weight of your iPad. It is also fairly bulky as well adding several inches all the way around to the iPad’s dimensions. Some users may question the practicality of this case because of this. But, for those who want better control over sound, home theater type viewing on –th-go, and better audio for gaming, these size and weight issues may be overlooked. 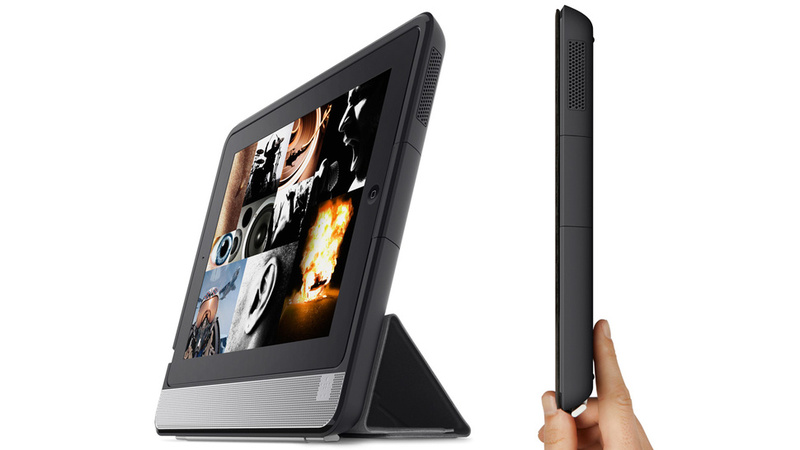 What do you think of this Belkin product, is it something you would use with your iPad? Please leave your comments below. Author Bio: This article was compiled by Kiran Smith who writes reviews on iphone 5 cases uk for the company Ace Case. They supply mobile phone cases and accessories.